This 8 week series is for people living with arthritis or with similar symptoms of pain and stiffness. It draws from a variety of styles to best address the specific needs of people with arthritis. In this gentle class, you will learn how to use yoga and modifications to manage your arthritis. We may use chairs, blocks, the wall, or other props to support your body in the practice as needed. The class also includes information about meditation, diet, and physical activity to support you in your healing, offering the full benefits of a complete yoga practice. As you learn how to work with yoga for your body, you will also begin to create a home practice, allowing you to extend the benefits of yoga into your every day life. This class comes with a manual, and meets twice a week for 8 weeks. 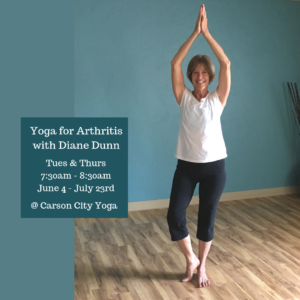 This class is taught by our Yoga for Arthritis specialist, Diane Dunn, and is based on the research presented by Dr. Stephanie Moonaz, a leading expert on yoga for arthritis. 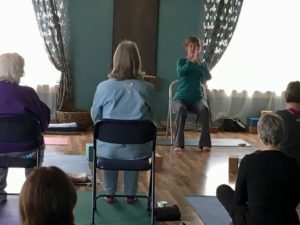 It was the information and experience that Diane received from her own work with yoga and therapy after a knee replacement, along with her course with Dr Moonaz that motivated her to share this information with the community. Read more about Diane here. This is an 8 week series, meeting 2 times per week. This class series builds on itself each week, and so it is highly encouraged that you attend all classes. Missed classes are not refundable or transferable. If you have any questions about this class and/or if it is right for you, please send us a note through our contact form. Diane will get back to you to answer any questions you might have.